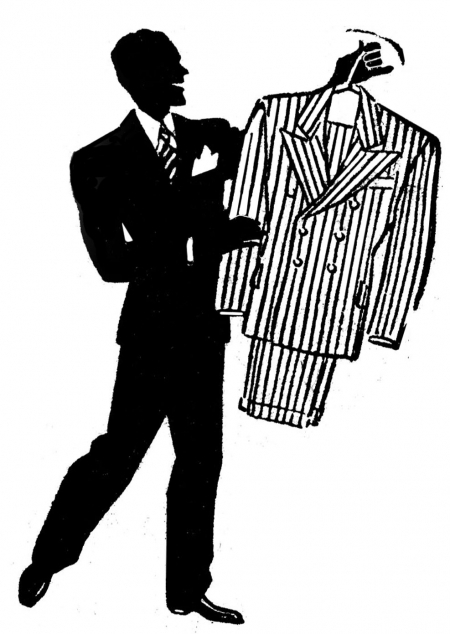 A Parisienne with a good many thoughts regarding menswear goes to some length to impart that men are dressing worse, not better, and the substitution of the dinner jacket (read: "Tuxedo") for the tail-coat is an example of the slovenliness to come. "You are entirely wrong in imagining that we pay no attention to the way men dress...The truth is that while we may say nothing, we do not in the least consent, and we find, messieurs, that for some time now you have been very much changed, and for the worse." When the smoke cleared following the close of that dreadful unpleasantness that spanned the years 1914 to 1918, there remained much work to do; bodies to be buried, cities to be rebuilt. Men and nations prepared to face the new realities that came with the new social structure; many weighty subjects had to be addressed that had been ignored for so long a time. The most pressing of these topics was deciding which was the proper combination of white waistcoat and dinner jacket? In an age of industrial slaughter, which was more suitable: double-breasted or single-breasted? and what of ties, shoes and overcoats? "No one completely personified English qualities in attire than the Prince of Wales...Whatever he chose to wear was considered correct and in good taste and was accepted by millions of others in America and elsewhere. Following are a few of the styles that can be traced right back to the Duke of Windsor, either because he wore them first or was responsible for their spread..."
-they include such fashion innovations as the Panama hat, the spread collar and brown buckskin shoes among others. More articles about the Duke of Windsor can be found on these pages. Some call it "the Mad Men Look", others may simply label it that "late 50s/early 60s look" - but either way high praise should be dolled out to costume designer Katherine Jane Bryant who so skillfully brought these fashions to the attention of millions of men through her work on the T.V. show Mad Men (AMC). For those lads pursuing an advanced degree in pulling-off that look in their daily attire, we recommend this handy list of fashion's "Do's & Don'ts" from 1960. In merely nine paragraphs the attached men's fashion magazine article from 1950 outlines the style and fabric that was put to use in the manufacturing of men's underwear between 1890 through the Forties (wool to nylon). "The male is a shy creature, and has always been particularly fearful of appearing conspicuous..."
Click here to read an editorial about the need for reform in men's attire.